Picture a peninsula with steep hills, thick forests that barely let the sunlight through, misty valleys, and fortresses clinging to the mountainside... and beyond the oceans, the vast and mysterious Continent. In such awe-inspiring landscapes, the Shadows of Esteren role-playing game will introduce you to a gritty, realistic world, where supernatural elements are never trivial or meaningless, and where men have to face fierce threats lurking in the dark. A Gaming Universe Discover the world of Esteren through the eyes of its inhabitants, especially those of Tri-Kazel's peninsula. Divided into three kingdoms, its political, geographical, and historical aspects are described. The lifestyle, the antagonisms among the factions, and the problems its inhabitants have to cope with on a daily basis are extensively portrayed. 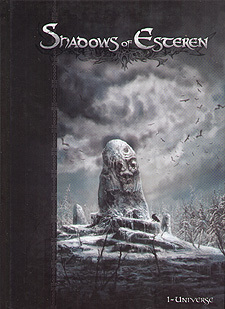 A Complete System Giving priority to the atmosphere and interactions among the Players, the game system of Shadows of Esteren will notably allow you to create your Characters, manage the evolution of their sanity, use Magience, uncover the secrets of the Oghamic arts, call upon the power of the Creator, etc. Player Aids This book includes six archetypes illustrating a few of the possible roles you can play, technical texts about assembling a group of Characters, a complete glossary and index, the character sheet, etc. These player aids will allow you to set up your first game sessions while fully introducing you to the Shadows of Esteren series.